In Argentina, inspiring Patagonian scenery and great hiking rival any in the world. We left winter in Seattle to enjoy summer in Buenos Aires, Patagonia (in Argentina and Chile), and Antarctica from February 3 to March 11, 2005. Below are photo highlights, travel tips, and detailed self-booked itinerary. Spanning both Argentina and Chile, the foot of South America is known as Patagonia, a name derived from coastal giants (“Patagão” or “Patagoni” who were actually Tehuelche native people who averaged 25 cm taller than the Spaniards) who were reported by Magellan’s 1520s voyage circumnavigating the world. The best time to visit Patagonia may be from March to April, when tourists disappear, yet most services remain open, wild windy weather calms somewhat, and beech tree forests glow with fall colors. At the beginning of March, children go back to school, parents go home, and crowds disappear. Late February through March has less wind and rain than earlier in the summer. High tourist season in Patagonia runs from December to the end of February, when accommodation and other services should be booked in advance. Avoid overcrowding January to mid-February in Los Glaciares National Park, Argentina. Patagonia is very windy all year. November can be the windiest. September to January are frequently blasted with high winds (gravity-fed katabatic winds or williwaws) which rush off the Patagonian icecap at 60 mph all day, sometimes up to 100 mph. Even in late February/early March, which have the lightest summer winds, we experienced steady 50 mph winds about every third day! The ozone hole over Earth’s southern atmosphere is worst September to mid-October and continues through January — apply sunscreen every day, including cloudy days. Easy boardwalks and stairs give wide views of Perito Moreno Glacier, an impressive wall of ice 200 feet high, 3 miles (5 km) wide, flowing into Lake Argentina in Los Glaciares National Park, in Santa Cruz province. Easy access to the awesome glacier makes it one of the most popular sights in South America. The glacier flows up to 2300 feet thick and originates in the huge Hielo Sur (Southern Icefield). The flowing ice periodically dams an arm of the lake which rises for a few years then breaks across the nose of the glacier as a crashing river (in March 2004 and 1991). In 2005, a narrow river flowed across the face of Moreno Glacier which calved large chunks of ice into the water with a loud crash several times per day. In the past 90 years, its melting has equaled its advance (up to 2 meters per day, 700 meters per year), so the glacial terminus has roughly stayed in the same place — a rarity in a time of global warming. Laguna de los Tres (15 miles, 3200 feet round trip) is one of earth’s most spectacular glacial cirques, a favorite hike. Be sure and ascend the 300-foot hill above Laguna de los Tres (Lake of the Three) for the best view, which includes glacial-turquoise Lago Sucia (Dirty Lake) far below. Options: backpack or horsepack to the campground for 2 or 3 nights for more time exploring awesome beauty. Loma del Pliegue Tumbada (12 miles, 3000 feet round trip, plus 3 miles and 1000 feet higher if you go to the top of the third hill with the best view). Views are so impressive that we hiked a second time in better weather. See Cerro Torre and Fitz Roy together at several viewpoints. Start this spectacular hike at Los Glaciares National Park Visitor Center (before crossing the river bridge into south end of El Chaltén). Start early to photograph classic sunrise views of the Fitz Roy Range on the main road a few hundred yards east of the Visitor Center. Torre Lake (6 hours round trip) has an excellent close view of Cerro Torre. Halfway there, cool wave clouds sped over Mount Fitz Roy but clouds obscured Cerro Torre. 50 mph winds at the pass turned me back. Rio Electrico to Cerro Electrico Oeste peak gives spectacular views looking south to the Fitz Roy Range. Optionally hire pack animals to support a tenting trip here, or possibly overnight at private Refugio Los Troncos, or day hike from a vehicle parked along the nearest road. The day hike is very steep with good views along the way. As the port closest to Antarctica (400 miles across the Drake Straight), Ushuaia hosts most of the cruise ships that visit the southernmost continent. Fly to Buenos Aires, Ezeiza airport (code EZE, Ministro Pistarini International Airport). Stay in San Telmo barrio (oldest neighborhood in Buenos Aires). See tango shows, shop at street fairs, dance in Dorrego Square. Fly 1500 miles from Buenos Aires to Ushuaia (airport code USH), in Tierra del Fuego province of Argentina. Eat king crab pizza with frosty beer, take the ski lift to hikes, and walk in Tierra del Fuego National Park. From Ushuaia, cruise 12 days round trip with GAP (now called G Adventures) through the Beagle Channel and across rough 400-mile Drake Straight to explore the frozen Antarctic Peninsula. Fly a short hop from Ushuaia to working-class Punta Arenas (airport code PUQ), in Chile. Ride vans and buses to tourist town Puerto Natales. Bus from Puerto Natales to lodges or trailheads in Torres del Paine National Park (Chile). Trek or day hike happily for a week. Bus from Puerto Natales (Chile) to thriving tourist town El Calafate (which has an airport with frequent flights from Buenos Aires) in Argentina, where awesome Perito Moreno Glacier is a popular day trip. Most people take a bus tour to Moreno Glacier round trip 8:30am to 5:00pm, which most hotels can book upon your arrival. But for better photographs, rent a car, drive in early around sunrise (2 hours driving one way), and experience morning light from the boardwalks. Staying for sunset light may also be good. For two or more people, car rental is cheaper and more flexible than a bus tour. Bus from El Calafate round trip to frontier town El Chaltén. The road is now paved and 2.5 hours by car or 3 hours by bus. (The formerly gravel road took 5 hours by bus in 2005.) Explore spectacular Mount Fitz Roy via classic day hikes. From El Calafate Airport (code FTE, 20 km east of El Calafate), fly back to Buenos Aires. Frequent daily flights. 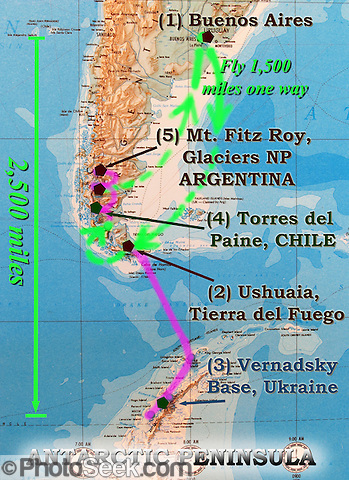 For more itinerary details, see our 2005 Patagonia/Antarctica complete trip planning notes (21 pages).